Rockingham Duathlon is back for 2018! At Rockingham Circuit, Europe's fastest circuit. Choose Sprint or Standard distance - after much consideration working with Triathlon England Events Team & Race Officials we have decided that this will continue to be a non-drafting race (draft illegal) so aero bars are allowed. No changes for 2018! The course has a gentle climb on one corner but overall, it is very flat. With smooth tarmac, and free of traffic and potholes, the only thing to focus on is your personal goal! On the sprint distance the 5k run covers 1 lap of the inner circuit and the bike takes in 8 speedy laps for the Sprint, and 16 laps for the Standard race, of the oval with a final 5km run lap before crossing the finish line under the main grandstand. Duathlon Rockingham will have the following: Chip timing Secure transition Regular water stations on the run Fully marshalled Bespoke finishers medal Trophies for 1st, 2nd, 3rd man Sprint & Standard Trophies for 1st, 2nd, 3rd woman - Sprint & Standard Trophies for 1st, 2nd, 3rd team - Sprint & Standard Race merchandise Race photographer will provide FREE photos to share & download Sports Therapist for FREE post race massage Sheltered venue near race start & finish with hot food & drink & CAKE! Full medical provision Ideal for novice through to elite The team consists of 2 or 3 members. If your team has 2 members, the first member will conduct both the run elements and the 2nd member will conduct the bike section. If your team has 3 members, 1 member EITHER conducts the 1st run, the bike or the final run. The team can consist of British Triathlon Federation members and non-members. Any non-members must pay their £5.00 Day Licence fee at registration on the day of the event. 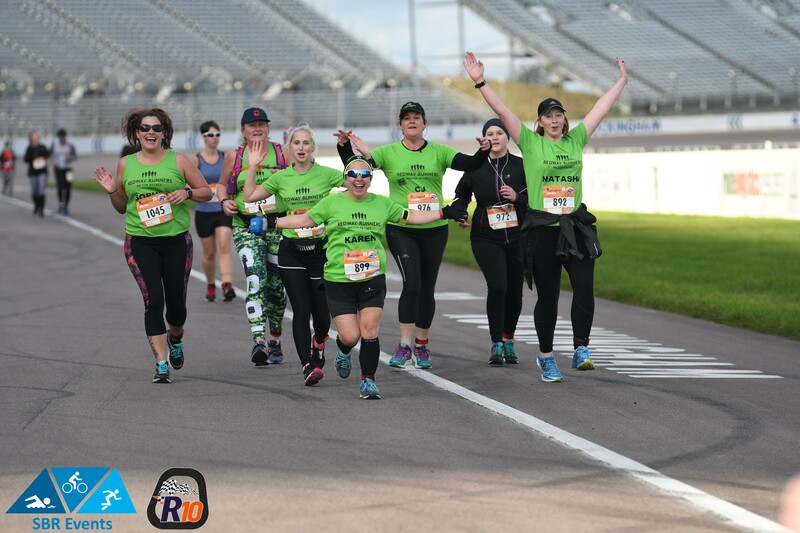 Stay & watch or participate in Rockingham 10 - a 5k, 10k or 10mile race - back for it's 5th year at 1pm. EARLY BIRD PRICES END ON SUNDAY 29TH JULY (FULL PRICES IN BRACKETS) SPRINT (min age 15) BTF Affiliated £30 (£35) Non affiliated £35 (£40) Team £45 (£50) STANDARD (min age 17) BTF Affiliated £40 (£45) Non affiliated £45 (£50) Team £55 (£60) ENTRIES CLOSE MONDAY 22nd OCTOBER 12:00 MIDNIGHT. ON THE DAY ENTRIES - SPRINT £45 & STANDARD £55 - CASH ONLY PLEASE We have negotiated a preferred room rate at Best Western Corby for Saturday 3rd November; A discounted rate of £65.00 per room bed & breakfast based on 2 sharing / £55 B&B for single room Best Western Rockingham Forest Hotel, Rockingham Road, Corby, Northants, NN17 1AE www.rockinghamforest.co.uk 01536 401348 Quote "Rockingham Speedway" when booking you will be quoted this rate. Unable to compete but able to help with marshalling 7.15am - 1pm or 10.30am- 3.30pm? Please email amanda@sbrevents.co.uk with your name and mobile and we will advise you with the time to be at Rockingham.